Undoubtedly the Greeks Rotting Christ are an iconic band within the genre of metal music, with twenty-nine years in their backs and eleven previous recordings, they throw us their newest production entitled "Rituals", containing eleven cuts very heavy, dark and loaded of cryptic ambience, very ritualistic as it asserts the title of the album by itself, this is an album hard to swallow in a single night once you hit the play button you better be patience to listen song by song until the end with the most open mind to perceive what they have been trying to play for the last decade an unusual blend of extreme, obscure and simplistic metal. There is nothing wrong with such formula, but over the years tends to be something not surprising at all, the songwriting excels in few songs retaining your attention and for a couple of minutes banishes the monotonous and repetitive sound, due to the pungent riffage, disturbing drums and throaty vocals, the Gregorian chants add a dark vibe and mythic. 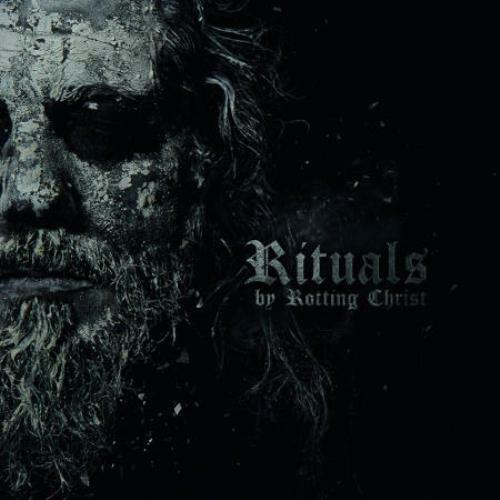 The sound captured in "Rituals" is cohesive and bizarre from the beginning you can appreciate it "In Nomine Dei Nostri" with rigorous fluid and crude recited prose immerses you in a dense and macabre atmosphere, "Ze Nigmar" it just extends in the same vein as the previous track with more corrosive guitar work, it is followed by "Elthe Kyrie" fast riffage since the beginning turns to be very infectious with the decadence inflicted and therefore, this is the most catchy cut in the album, saturated in melodies and powerful vocals well mixed with female clean vocals of Danai Katsameni she is an actress of the National Hellenic Theater and she owns the piece in a unique way and leads to excellent guitar solo, I will skip few song just to land in "Les Litanies De Satan" is structured with slow riffing and fast marching drumming, infusing an aggressive sense that allows Vorph (Samael) to infringe raw vocals in french, "For a Voice Like a Thunder" featuring Nick Holmes (Paradise Lost) delivering astonishing spoken words in the background interwoven with the relentless guitar riffing and compact drumming to induce the catharsis, "Devadevam" stand out for the use of Hindu style melodies blended with some kind of atmospheric black metal and embedding of the pseudo Gregorian choirs, "The Four Horsemen" you might think is a cover of the classic Metallica repertoire, but definitely is not! is a mid pace track with somber elements marauding between doom like passages and eerie ambient sound effects beautifully crafted but distant and omnipresent, the closing track is "Lok'tar Ogar" which work more as a filler for me, for the repetitive elements already mentioned. Tolis Brother's and company has delivered an album that barely reach what I could describe above average, lacking dynamics and repetitive at some point, with a handful of decent tracks that worth the time to listen, I still missing the Rotting Christ of yore and I still playing very often their four first releases, however if you like what they have been playing during the last ten years, I'm sure you will disagree with me and I will be happy if that happen.